Plus your RV questions, comments, Tips and an off the beaten path report. This episode of the podcast comes to you from the heart of the Smoky Mountains in Bryson City, NC. We are recording this very special episode – number 200 – from the picnic table outside our RV at our Roadtreking Whitewater River Gathering near the banks of the beautiful Nantahala River. And what a special gathering it is. We were surprised by a beautiful 200th episode cake, complete with our logo, by our fellow Roadtrekers at our social hour get together last night. What a great way to celebrate. Thanks to everyone for making us feel so special. Tom McAllister, who says he has listened to every episode, orchestrated it all and it was as delicious as it looked. We have people here from across the country and again, as always, our gatherings are for people in every sort of RV. Roadtreking is built around a lifestyle, a state of mind, not a particular brand. We have people in Airstreams and other travel trailer brands, an Itasca Navion Class C, a Coachmen on the Ford Transit chassis and of course lots of Roadtreks. That's Rick, the videographer from the Erwin Hymer Grouo of North America, shooting us cutting the cake. Rick is here making a documentary on the gathering. Our people will be spending the week whitewater rafting down the Nantahala and a couple of other rivers nearby, doing a mountaintop to mountaintop mega zip line ride and sightseeing on a train that takes us into the Natahala National Forest gorge. The weather has been great and the scenery is terrific, unbeatable. We have had a great time and we had a great time getting here. Our GPS directed us on US Highway 129 after we left I75 near Knoxville, TN. And the two lane road took us into North Carolina. It started out like any other two lane road but after a couple miles as it climbed from the foothills into the Smoky Mountains, we noticed it seemed to have a lot of curves. Then we noticed how many motorcycles there were on the road with us. Turned out the road is one of the most famous in the world for motocyclists. It’s called the Dragon and one particular stretch if it – 11 miles in length – is known as the Tail of the Dragon. It has 318 curves in those 11 miles. And we did it in our RV! We were so impressed by it we shot a video on it that you’ll be able to see in a couple of weeks. Speaking of videos, we have posted a special video about our 200th episode. We’ll embed it with the shownotes for this episode at Roadtreking-dot-com-slash-200. And tomorrow on our RV Lifestyle Channel on YouTube, we will post our video of the week, which takes you on a boat ride in Lake Superior to visit the spectacularly beautiful Apostle Islands. Please check it out and be sure to subscribe to our videos there on YouTube. A new video is released every Thursday morning. Of course, Sunday night at 7PM eastern is our Ask Us Anything Live You Tube broadcast and on Wednesdays with the podcast, we try to do a video version of our interview of the week. A story about research out of England last week made official what many of us long suspected – being outdoors not only makes us feel better, it is literally good for our health. A University study in England examined global data from 290 million people in 20 countries, included the US, and found living close to nature, and spending time outdoors reduces the risk of type II diabetes, cardiovascular disease, premature death, preterm birth, stress, and high blood pressure. To read more, click here. Extreme dry conditions led officials to ban all fires from Rocky Mountain National Park last Friday until further notice. That includes a ban on using charcoal grills, though propane grills are allowed if there is an on/off switch on the grill. This is the first time since 2012 such a ban was in place, according to a press release from the National Park Service (click here for more information). Colorado firefighters were battling 11 forest fires of 100 acres or more last weekend throughout the state, affecting more than 200,000 acres according to one story. To learn more about fires in Colorado, and how they may affect your camping plans, click here. National Park officials in the U.S. and Canada were urging visitors to be careful and stay on the designated trails and walkways after a number of tragic accidents last week. At the Grand Canyon National Park last week a visitor climbed over a railing at Mather Point, lost his footing and fell 500 feet to his death. At Canada's Shannon Falls, one of British Columbia's tallest waterfalls, three YouTube daredevil travel stars died after one slipped while walking along the waterfall and fell, and two others jumped in to save her. The same three were fined and banned from American national parks after going off trail two years ago walking on a delicate area of a hot spring at Yellowstone National Park, among other things. To learn more about their tragic accident click here. For safety tips and more on the Grand Canyon accident click here. If you are planning to do any boondocking on federal land near Grand Teton National Park or the National Elk Refuge anytime soon, be sure you're up on the latest camping changes. A story out last week stated the U.S Forest Service is concerned that the large number of dispersed campers in the area is damaging wildlife and vegetation. The Forest Service will be updating its Motor Vehicle Use map and changing some dispersed camping rules to protect the area. Officials are also concerned about the amount of trash dispersed campers are leaving behind. To read more, click here. Lately, people have been asking Mike about the dry erase board we keep on our RV’s refrigerator. It was a great reminder that some things we do and take for granted may be a new thought for others, so I thought I would tell everyone about it this week on the tip of the week section, in case it could help you. On our refrigerator we keep have a small dry erase board attached by double-sided sticky tape. On the board we always write down the name of the place we are camping, and if we're in a campground, our site number. Why do this? In case of an emergency. Long ago when we were newbies we were taught to do this in case we ever had an emergency, maybe someone was injured and we needed to call for help in the middle of the night. If something like this were to happen, in such a time of stress it could be hard to remember our site number, or even the official name of the campground. So by always writing down the name of the campground and our site number on this board, we know where to look if an emergency were to happen. But it has become very help for jotting down a campground’s wifi access code, and we use it to jot down things we need to pick up when we go in for supplies, the lot numbers of fellow campers, the schedule of activities we want to take in and reminders about the things we need to do that day. Gary, who is six five, is worried about finding a Class B RV that can accommodate his height. And he is also worried about enough room for his wife and three digs. Gretchen has asthma and wants to see more smokeless campfires. In Colorado over the weekend, a 19-year-old man camping in Ruby Gulch south of Ward was struck by lightning Saturday afternoon as he stood next to his tent. The man was with his girlfriend in Ruby Gulch, located off of U.S. Forest Service Road 328E, when he was struck at about 2:30 p.m. His girlfriend immediately tried to revive him as she called 911 for help, according to a news release from the Boulder County Sheriff's Office. The woman was able haul her boyfriend into a car and drive him to Colo. 72 and Forest Service Road 328 north of Nederland. Medical personnel responded and took the man, who was conscious and breathing at the time he was transported. He is lucky. Over the last 20 years, the United States averaged 51 annual lightning strike fatalities, placing it in the second position, just behind floods for deadly weather. In the US, between 9% and10% of those struck die, for an average of 40 to 50 deaths per year (28 in 2008). Two of the most at risk groups are campers and hikers. This week, we talk about lightning safety. What RVers should do when a thunderstorm approaches, where and when to sake shelter and what to do if you are caught out in the open. Our guest is John Jensenius, a lightening specialist meteorologist with the National Weather Service’s National Oceanic and Atmospheric Administration. Mike Wendland: Well, John joins us right now. And John, you are in, as I understand, in a cabin up in the Adirondacks. Is that right? John Jensenius: Hello, Mike. Yes, I'm in a cabin in the Adirondacks of New York State and enjoying some rather warm weather. We should be seeing some thunder storms later today. Mike Wendland: Well, yeah, I'm recording you from actually Michigan, and we have the same thing coming. And that's, of course, what we want to talk about. The Lightning Safety Council came out with a report last week, examining lightning stats, and I was amazed to see that camping is the number three most common activity people are doing when they're hit by lightning. What is it about camping that puts people at risk? John Jensenius: Well, the fact that people are outdoors, and a lot of the times, they're in tents, which leaves them completely unprotected from the dangers of lightning, so when we talk about lightning, in order to be safe, you need to get to a safe place. And in terms of camping, and especially if you're some distance from safety, it can take a while to get there, and if it's at night, people just can't get to safety in time. So it's always good to plan ahead so you can get to a safe place. Mike Wendland: Well, if you are in typical campground and a thunder storm is rolling in, I guess the first question is where is lightning likely to hit, and probably before that happens, what should the camper or the RVer do? John Jensenius: Well, the most important thing to know about lightning is that it comes down somewhat blindly from the sky. It does tend to strike the tallest objects in the immediate area, so you don't want to be near the tallest object, or you don't want to be the tallest object. But really, when it comes down to it, where you want to be is inside, either a substantial building that has wiring and plumbing, or else inside a hard-topped metal vehicle. And that metal vehicle will provide you with safety. But as far as camping, probably one of the biggest concerns is that people simply wait too long to get to that safe place. Lightning can strike outward from a thunder storm as much as 10 miles or more, which is about the distance that you can hear thunder. So if you're hearing thunder, even a distant rumble, you are in danger of being struck and need to get to that safe place immediately. Mike Wendland: Now, you mentioned a metal RV, I guess, with the hard top. Would an automobile or a truck? Is that a good thing to go inside of? John Jensenius: Yes, a metal RV, a truck, a car. And it's not the rubber tires that protect you; it's that metal shell that protects you. So any one of those will offer you protection. The key is that you're completely inside. We often recommend just closing the windows, just to make sure that you are completely inside. But they do offer protection from a thunderstorm. And I should point out that they may get struck. If they do, sometimes the electronics get fried, but the people inside are safe. Mike Wendland: Now, a lot of our RVs now have become super lightweight, with aluminum or fiberglass. Is that safe? John Jensenius: Well, the more metal around you, the safer you're going to be. So if it has a metal frame around the RV itself, it's probably fairly safe, particularly if it has a metal shell. Makes it even safer. But for the most part, you're going to be safe inside an RV. Now, if you have a part that extends outward that's not metal, not safe to be in that part. Mike Wendland: Like an awning or something. And I suppose if you were in a park, an organized campground, go into, if nothing else, to the bathroom, which are usually brick, or somehow they're built up a little more substantial. Or the office area or the clubhouse, and I know most campgrounds have information about where to take shelter. That takes me to choosing a camp site. Is there any type of advice that you would offer about choosing a camp site in the time when thunder storms are coming? What's a good camp site to choose? What's one to stay away from? John Jensenius: Well, there are a couple dangers that come with thunder storms. One, of course, is the lightning. The other is the wind. Lightning tends to strike the tallest object, so for lightning, you would want to stay away from any of the taller trees. But the other part of it is, of course, the wind. And wind often snaps trees or uproots trees, so again, if you can get away from those taller trees, particularly the pines, you'll be safer that way. Another thing that people don't understand is that when lightning strikes a tree, people assume it just goes deep into the ground, and in reality, it spreads along the ground surface. So anywhere near that tree can be dangerous. Lightning will strike the tree. 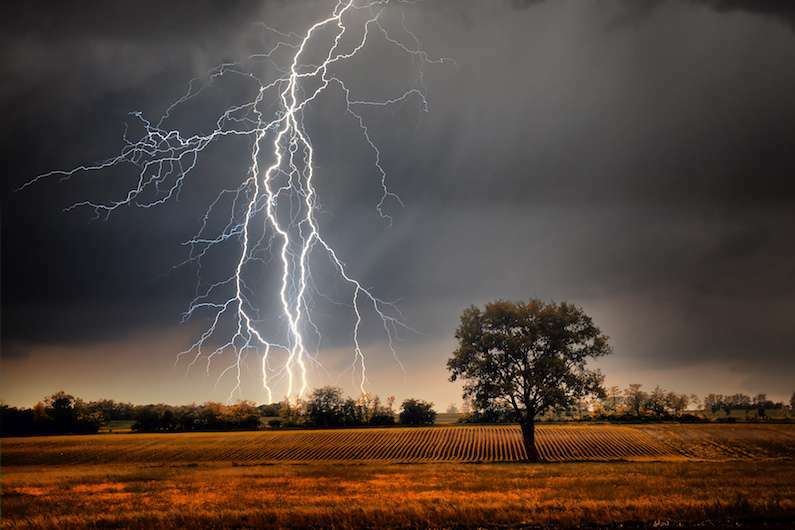 It will spread out along the ground, so the entire ground around a tree that is struck by lightning becomes electrified, which is why it's important to get inside. Mike Wendland: Now, many of our listeners enjoy going out for hikes. If a thunder storm happens when they're out on a hike, and perhaps your RV or buildings are far away, what should you do? John Jensenius: Well, that becomes a very dangerous situation, and the truth of the matter is that once you're in that situation, there's not an awful lot you can do to be safe. So rather than trying to figure out what to do when you're out there and a thunder storm arrives, it's important to try and plan ahead, so that you don't get in that situation. So first of all, we would recommend listening to the forecast and if there are thunder storms in the forecast, that you consider canceling or postponing that activity. Many areas, in fact most areas, thunder storms tend to develop in the afternoon and evening, so if you have an activity, for example, if you want to go on a hike, go early in the day, so you would tend to avoid that thunder storm threat. And that's particularly true in the western part of the United States, where we generally recommend that any hiking be completed by about noon. And then if you are going outside, keep an eye on the sky. Watch for any clouds that are developing vertically, developing into what we call a cumulonimbus cloud, a thunder storm cloud. And if you see that start to develop, head to safety right away, because if you are some distance from safety and suddenly there's a thunder storm there, there really is very little you can do. The one thing we do recommend in that situation is that you run as quickly as you can toward a safe place. You may not be able to get there within five minutes, 10 minutes, but a typical thunder storm may last 30 minutes or more. So that may allow you time to be safe from at least a part of a thunder storm. The other thing it does, is it keeps one foot off the ground, if you're running. And that, in fact, actually reduces the chances of the ground current affecting you. Mike Wendland: Really? Yeah. That makes me ask. Do the directions change by the type of terrain you happen to be in? You know, rolling hills, mountains, flat land, in the woods. Do the directions alter anywhere, in that area? John Jensenius: Well, not really. In all those situations, we don't want people to be caught outside. In your higher mountains of the west, because they typically do have afternoon thunder storms just about every day, we do recommend that people do any hiking before noon. And in a situation, for example, if you're camping in Florida, typically, you see afternoon thunder storms pop up every afternoon, in some areas. And again, it's a similar thing, that if you know your area and know when the thunder storms pop up, you just try and avoid that time. But at the same time, not every day is the same, so you do have to keep track of the sky. Watch it. Listen for thunder, and if you do hear thunder, get to a safe place right away. As many campers know, it is not easy at times, especially if you're in a wooded area, to see the sky. So again, that listening to the forecast, and taking it very seriously, is important, because once you get out there, and once you start hearing thunder, if you're some distance from safety, it is very dangerous. And potentially deadly. Mike Wendland: Now, I've heard stories … I think my parents taught us this, that you could tell how far lightning was away by counting the seconds after you see the flash, until you hear the thunder. Is there any truth to that? John Jensenius: Yeah, well, the speed of sound is about 1100 feet per second, which means that it takes the sound of thunder about five seconds to go a mile. So if you count the number of seconds between the flash of lightning and the sound of thunder, then divide by five, that will tell you how far away that particular flash was. Doesn't tell you how far away the next one is going to be, but it does give you some indication. Now, I mentioned before that lightning can strike outward ten miles, which would mean that would be a full 50 seconds of counting, and people usually assume that it's a much longer distance away when it's that much time in between the flash and the thunder. So as another example, if you count to 20, that means the storm is only four miles away, which is much too close. Mike Wendland: And last question I want to ask is, we talked about the time of day. What about the region of the country? Where are most of the lightning deaths or injuries? Where do they occur? I would guess Florida, probably, because it's at peninsula? John Jensenius: Well, it's an interesting question you ask there, because when we look at the number of flashes and the number of people, obviously, Florida is an area where we do see the most lightning deaths. However, but if you look at it in terms of per capita, so how many people per million are being struck, it's usually areas where people tend to be outside, areas of the west, the northeast, where people tend to be vacationing, camping, doing all kinds of outdoor activities, and maybe not wanting to be inconvenienced by a thunder storm. And it's that combination of those outdoor activities and the lightning that causes the deaths and injuries. In fact, about two thirds of the fatalities we see come from people involved in leisure activities, whether it be camping, fishing, boating, beach activities. And those are all concerns, and as I said, I think part of the problem is that people just simply don't want to be inconvenienced by a thunder storm, particularly if they perceive it as being somewhat distant. And in that particular case, where you're hearing that rumble of thunder, you really need to get inside. Mike Wendland: Well, John, I want to thank you for making time from your getaway there in the Adirondacks, to help us get our heads around lightning safety. We'll put links to brochures and information, The Lightning Safety Council. And I want to thank you again for being with us, and I guess, keep your head down out there, John. John Jensenius: Well, thank you, Mike, for having me on. And as you said, The Lightning Safety Council has a website. The National Weather Service has a lightning safety website as well, and all kinds of good information on both. Mike Wendland: We will link to all of them, and throw in a couple of apps that people should have that will help them keep track of the weather as well. John, thank you again, and have a great rest of the month. John Jensenius: All right. Thank you, Mike. Think about the last time you gave someone your location. Bet you gave a street address. But chances are you still had to give those folks additional directions once they got on site, right? Well that’s where a new map app called What 3 Words comes in. They’ve gone ahead and sliced the entire world up into a grid of 3 meter by 3 meter squares. And each of those squares is labeled – not with latitude and longitude or street names – but instead with three words. So let’s take your recent trip to Glacier National Park. You all parked your RVs at the Chewing Black Bones Campground. The address on US-89 will get you to the park, but from there you’d have to give any visitors to your site additional instructions or landmarks to find you. Instead, if you used What 3 Words, you could give visitors the address of: bumping.credential.stormed. This not only directs them to the campground, but your exact campsite in the campground. Pretty neat, right? And if you’re thinking you don’t need another map app, keep in mind you can still use the maps you know and love – like Google Maps, Waze, etc – you just plug the three words into What 3 Words first. It’s precision and simplicity all rolled up into one! The Nantahala is in western North Carolina in the United States, within the Nantahala National Forest, and near the Great Smoky Mountains National Park. Two-lane U.S. Highway 19/74, once part of the Trail of Tears, runs along the river, picnic areas dotting the route. The River rises near the border of Georgia and North Carolina, close to the Southern Nantahala Wilderness and the Appalachian Trail. It empties into the Little Tennessee River at Fontana Lake.The word Nantahala is Cherokee and means “Land of the Noonday Sun”. The river runs through a narrow and steep gorge where in some areas the sun reaches the ground only when it is directly overhead during the middle of the day. This river is popular with whitewater rafters, canoeists, and kayakers. Commercial rafting began in 1972 when the Nantahala Outdoor Center opened, leading to thousands of paddlers annually running the river. Today there are ten different outfitters operating on the Nantahala river. Each outfitter has a permit issued by the Forest Service which allows them to commercially raft the river. The Nantahala is one of the most popular rivers in the southeastern United States for paddlers of all skill levels. The river is a popular as a fly fishing destination. Although it is regularly stocked under North Carolina's Hatchery Supported regulations, it is home to one of North Carolina's healthiest populations of wild, stream-born Rainbow Trout. The river also has a self sustaining population of Brown Trout, many of which grow large. The current North Carolina state record Brown Trout, weighing 24 lb 10 oz (11.2 kg), was caught from the Lower Nantahala in 1998, and specimens of 10 lb (4.5 kg) or greater are fairly common. Bryson City which is the nearest town to us is a small town that serves as a gateway to Great Smoky Mountains National Park, with wildflowers, streams and part of the Appalachian Trail. The Great Smoky Mountains Railroad offers train rides through the park, plus the Smoky Mountain Trains Museum. The Tuckasegee River runs through the middle of town and is also popular for white-water rafting. The Fly Fishing Museum of the Southern Appalachians has fishing gear and 1800s fly rods. There are lots of campgrounds in the area. We’re staying at the Smoky Mountain Meadows Camground just outside town.